Dailyinvention.com is the creation of Stefan Holodnick. He is employed with the Kirtland Community College as Online Services Developer and very much enjoys the challenges of the job. He also does photography, music production, writes, and takes care of Wolf, his Miniature Schnauzer in his spare time. This work by Stefan Holodnick is licensed under a Creative Commons Attribution 3.0 United States License. …converted to Facebook. The Web 2.0 interface has won my heart and mind. It certainly makes MySpace look sluggish and inept as a social networking site. 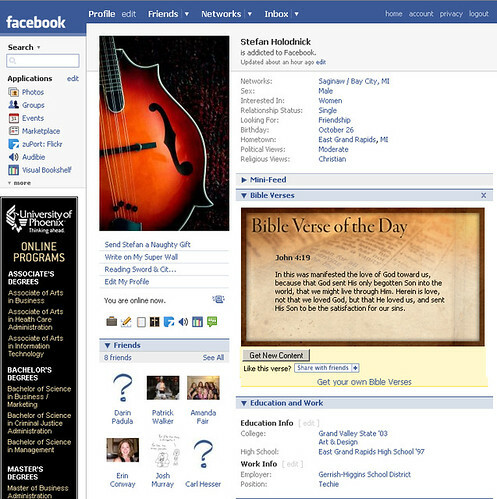 Although MySpace offers more of the ability to modify its look and feel, Facebook rocks its world bar-none. I like the modular aspect of Facebook. It contains several useful applications which are developed by many individuals from around the globe. For instance I added the application, zuPort: Flickr to my Facebook profile and pointed it to my Flickr feed. Now, it displays all my Flickr photos in a nice, manageable box. Another thing thing that I really dig is the ability to subscribe to your blog feeds. This posting itself will appear in my Facebook profile. MySpace, on the other hand, forces you to use their stupid blogging system instead of giving you any choice as to where you want your blog content to come from. A qualm that I have always had with MySpace is that their advertising is somewhat intrusive and very annoying. On my MySpace profile, as a joke, I put up the results of an on-line questionaire where it proclaimed that I was in fact a lesbian. The next thing I know all the advertising on my profile is for gay and lesbian sites. Facebook just has one little ad on the left side that I barely even notice. I know Facebook has been along for a while, and I may sound like I discovered the wonders of this web site before anyone else, but I’m just that geeked about it. I don’t know why I overlooked it for so long. I’m sorry for disappearing off the face of the earth…again. I haven’t done anything to update my social networking sites for the last 6+ months. Maybe I’ll get around to it. Give me a call if you get a chance. I’d call you, but I can’t find your number.